D1 In the correct way? yes that is the way it was soldered, silver band closest to power, now when I plug the arduino in to the computer, the green led comes on and then goes out. With a multi meter on ohms, check there is a connection to the am-vin pin from the diode silver end (should be directly down from where the diode goes threw the board. on the lower mega connector. There are some boards that have this trace missing apparently. one thing I noticed when I zoomed in on it: the deformity of the pin socket at the base, maybe melted from to many volts? if the reading of 7.16 is correct for a 5v bus. What do ya think? I was meaning on the ramps... the mega was just to point out what pin it was. but your mega pic is most enlightening! all that black around the vin pin isnt right... I suspect you have a dead mega, in particular the Vin pin, looks melted out! I would replace that connector and carefully scrape off the gunk and try again. ya I didn't think it looked right when I blew up the picture. //will try and change it tomorrow. Thats sounds like you where checking voltage... requested ohms for a continuity test.. also while its off. 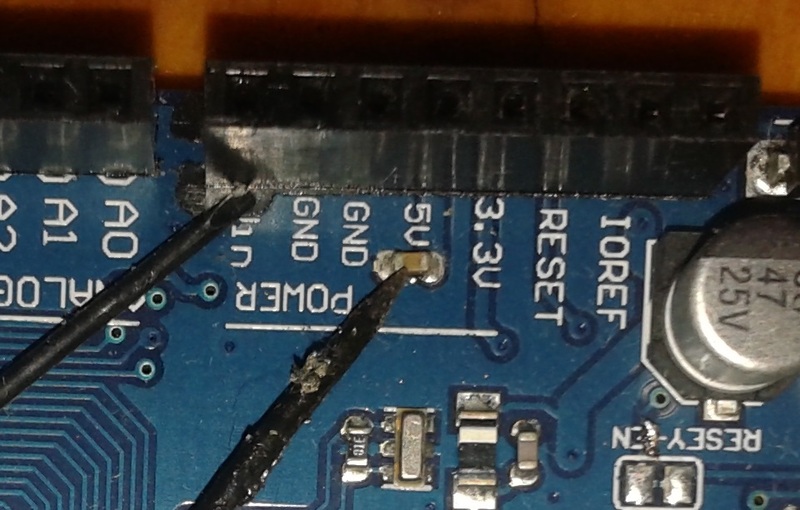 have you looked at the voltage reg on the arduino, looks like the magic smoke got out..? how do I check the voltage regulators, I think there are three?